Private 26888 Albert Joseph Walker, "B" Coy. 15th Battalion, Hampshire Regiment. Joseph was born in Newbury on 25 November 1896 the youngest child of John William Walker and his wife Maria (née Gore). Although registered as Albert Joseph it seems that he was known within the family as Joseph or Joe, though they reverted to Albert when filling in census forms. John and Maria had nine children in all, one died young (possibly Reginald 1887-1888), but eight were still alive when they filled in their census return in 1911. Joe’s elder siblings were: Nelly Louise (born 1877), Sarah Hannah (1879), Henry William (1882), Blanche (1885), Ernest (1890), Kathleen (1893) and Dora (1895). It was not only Joe whose name was to vary slightly, Sarah Hannah would marry as Sarah Ann Lucy Walker and their father switched his names from John William to William John. 12 York Road - the family home throughout Joe's life (few families were that settled). Throughout Joe’s life the family lived in a mid-terrace cottage in York Road, though the number of cottage varied between 2 and 3 Fairleigh Cottages. 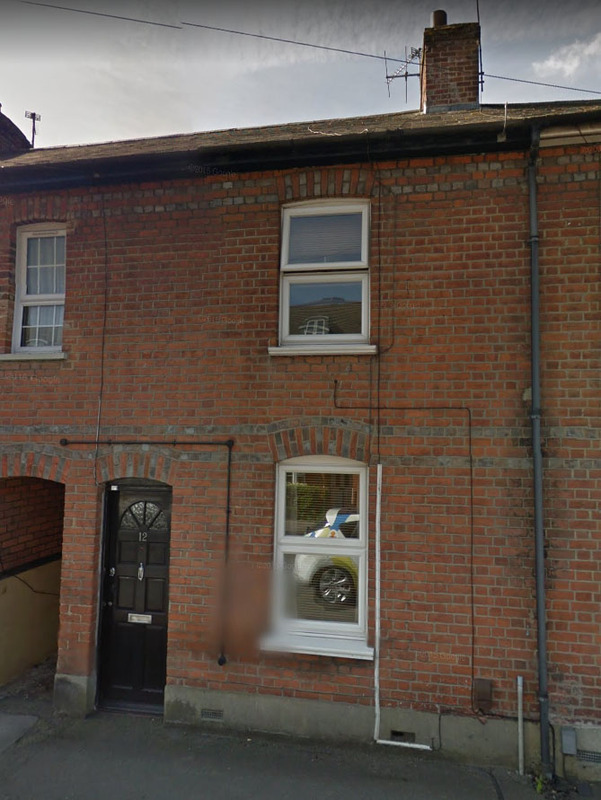 It seems that the four-cottage terrace was renumbered for some unknown reason - appearing in local directories as No 3 (1896-1903) and No 2 (1894 and 1904-1910). In 1911 this issue was resolved when the whole street was numbered and the Walker’s home became 12 York Road, as it remains to this day. The younger children (Ernest, Kathleen, Dora and Joe) were all educated at St John’s Infants and St Nicolas National School. Joe left school on 15 November 1910, shortly before his 14th birthday; at this time the minimum school leaving age was 12, so Joe got two years beyond this. St Nicolas’ did not offer schooling beyond 14 years of age. A few months later, at the time of the 1911 census, Joe was working as a Gordon Boy. This was precarious employment; the Gordon Boy organisation was run in pseudo-military style and provided youth labour for hire to do small jobs, running errands etc. As the boys were paid for the work they did, not the time they spent waiting for a job to turn up, their income was usually lower than that of a lad employed as an errand boy for a local shopkeeper. When war was declared in 1914 Joe was still under age for the army, which was not supposed to send men to fight until they reached 19 years of age. Joe signed up shortly before his 19th birthday – a fact that was announced in the local paper when it listed the names of 45 recent volunteers in its columns on 18 November 1915. Enlistment at that date was often under the Derby Scheme (a last ditch attempt to avoid the need for conscription), but Joe seems to have enlisted directly into the Hampshire Carabiniers at that time. He seems to have chosen this regiment because his brother Ernest was already serving with it. 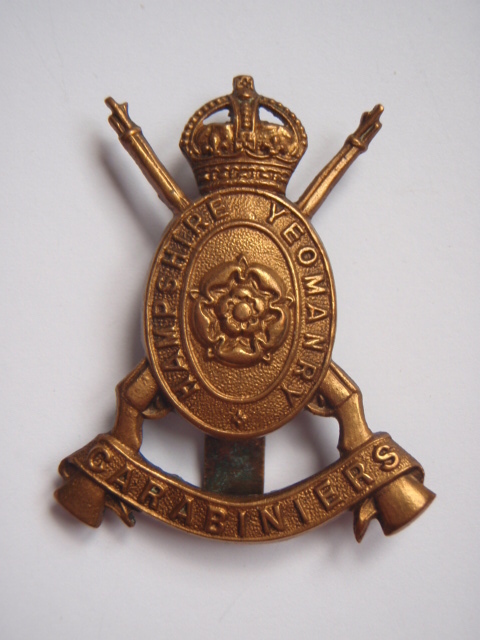 The regimental cap badge of the Hampshire Yeomanry. The Hampshire Carabiniers or Hampshire Yeomanry was a Territorial cavalry regiment that, like most Territorial units, created three units in the early days of the war. The 1st/1st Hampshire Carabiniers was formed around the men who volunteered for forego their right to remain on home service; the 2nd/1st Hampshire Carabiniers used those who refused to volunteer as the basis for a home defence unit and the 3rd/1st Hampshire Carabiniers became a training and reserve unit. These were known as first, second and third line units. Had this become a cavalry war this may have proved to be an effective organisation, but trench warfare meant that infantry were in far greater need and, even though the 1st/1st spent just over a year in France as cavalry (mainly as the IX Corp Cavalry Regiment) it was dismounted in August 1917 and trained as infantry. On 27 September 1917 it was absorbed into the 15th Battalion of the Hampshire Regiment. The men left in England serving in the 2nd/1st and 3rd/1st Hampshire Carabiniers were used to supply replacements (the Military Service Act of January 1916 effectively stripped them of any rights to remain on home service). It is not known which unit Joe trained with, but he was sent to France as an infantryman and served there with the 15th Battalion, Hampshire Regiment (well before all the remaining 1st/1st Hampshire Carabiniers joined this same unit in September 1917). As his service record was among the many lost in a fire in WWII it is not possible to tell when Joe went overseas, but the most likely occasion would have been in September 1916 when all second line Yeomanry units were instructed to send 160-200 men to France as infantry replacements. So he may have been with his battalion for almost a year when they formed up in preparation for an assault on German positions near the village of Gheluvelt, east of Ieper (Ypres) at dawn on 20 September 1917, or he may even have been one of the six men who reported for duty the day before the attack - we may never know. 5.40am was Zero hour for an attack which was made by the 122nd Inf Brigade with TOWER TRENCH East of GHELUVELT as its final objective. The attack was made on a two Battalion front, each Batn on a two Company front & was organised in depth. The Order of Battle was:- 15th Batt HANTS REGT on the left, 18th KRRC on the right, who were allotted the task of taking the first & second objectives. The RED and BLUE Line (West and East of BASSEVILLEBEKS respectively) after which the 11th WEST KENTS on the left and 12th E SURREYS on the right were to pass through and assault the final objective the GREEN LINE (TOWER TRENCH). The assembly took place without great difficulty and the attack was launched at 5.40am. The 15 HANTS were checked by a strong point which had been untouched by the barrage about 5 minutes after the start, which was soon overcome by the gallantry of Officers and men in storming the position. After this the BLUE line which was the Hants objective was reached without difficulty. Casualties were heavy including all four Company Commanders. A Counter attack was threatened from NE (on the MENIN ROAD) but was dispersed by rifle & machine gun fire. The 11th WEST KENTS passed through us but failed to take their objective owing to strong resistance from the neighbourhood of TOWER HAMLETS, and fell back on to the BLUE LINE. 5.30pm Orders were received to the effect that two Battalions of 122nd Infantry Brigade (the 15th Hants & 11th WEST KENTS) were to attack the GREEN LINE. The 11th WESY KENTS were too disorganised at the time so that the attack was carried out by 130 men of the 15th HANTS. The position was captured and over 40 prisoners, a Battalion Commander and his Adjutant, two Machine Guns and one Field Gun were taken. The objective was consolidated and held against several counter attacks in spite of the fact that the 123rd Brigade who attacked three times to our right failed to reach their objective. 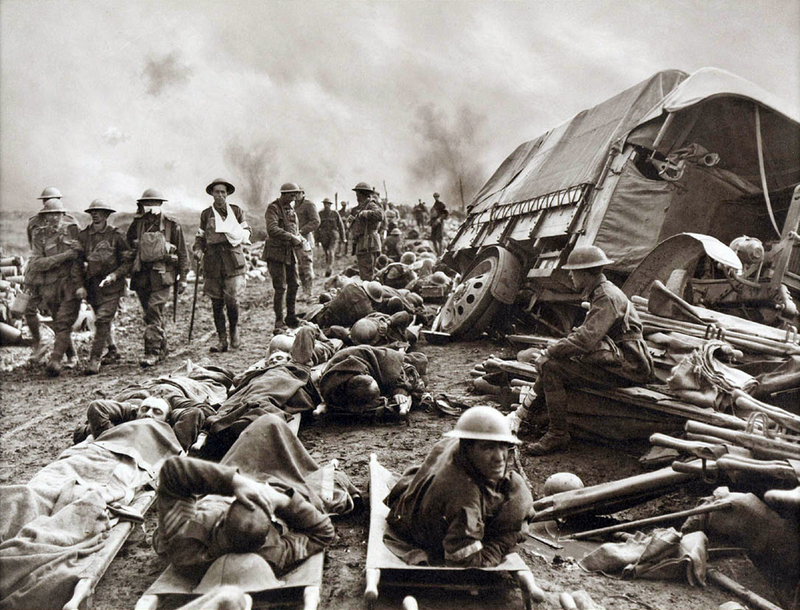 wounded at side of the road after the battle. This was typical of the battle, which was an Allied success using the so-called bite and hold tactics. This meant limiting the advance to remain within range of Allied artillery (taking a bite out of the enemy line) and digging in, consolidating the captured positions to defend against the inevitable counter-attack (and holdiing what is gained). By not advancing too far the British remained some distance from the German reserve troops that would be used to counter-attack – so it took longer to mount the attack, giving the British more time to ready themselves. Then, when the attack came, the infantry had solid artillery support, which often smashed the attack before it got near the new British positions massively improving the chances of holding them. The tactic was very successful in the war of attrition; for a change the defenders were suffering higher casualties than the attackers. However, it took at couple of weeks to prepare for such an assault and the gains were small, so it was not a tactic that would enable further reaching ambitions to be achieved (the original aim of the overall battle was to capture the Belgian North Sea ports). As a result the British were inclined to rush into less well prepared attacks – particularly when the weather turned the battlefield into a sea of mud making the movement of artillery, vital to the success of the tactics, almost impossible. Nevertheless the Battle of the Menin Road Ridge was a success, a bright spot in a gloomy period – but success was not achieved without a cost and one of the many casualties was Joe Walker. WALKER – On Sept 20, 1917, somewhere in France, Pte A J Walker, Hampshire Regt, youngest son of Mr and Mrs J Walker, 12, York-road, Newbury, aged 20. Joe’s body was never identified so, while he may lie beneath one of the thousands of stones marked A Soldier of the Great War – Known Unto God his name is remembered on the Tyne Cot Memorial to the missing of Passchendaele and the later fighting in the infamous Ypres Salient. In loving memory of our dearly loved son, Pte A J Walker, 15th Hants Regt, who died of wounds received in action on September 20th, 1917, age 20. And never said good bye. Though you are silent in the grave. From his sorrowing Father, Mother, Sisters and Brother. – RIP. 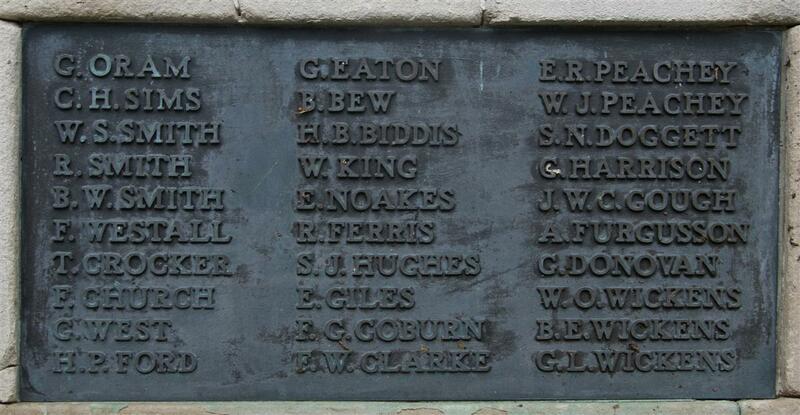 Locally he is remembered on Tablet 5 of the Newbury Town War Memorial. Ernest Walker had a varied military career, starting as a young in the Berkshire Yeomanry, the local Territorial cavalry unit. He evidently enjoyed his service with the Yeomanry since he decided to join up full time. He joined the Corps of Lancers of the Line on 11 April 1912 – but soon decided that it was not what he had hoped for and bought himself out on 11 June. During the war he served first with the Hampshire Carbiniers (No 1650), joining before his brother Joe. He first appears in the Active Service Roll printed in the Newbury Weekly News a week before the same paper announced that Joe had signed up. The Active Service Roll is not a reliable indication of enlistment date since it really only lists names after they have been notified that the man was serving – which could be months after he enlisted. However, it does show that Joe’s choice of the Hampshire Carabiniers was influenced by his elder brother’s choice. Once they had enlisted they were in very difference circumstances, Joe was a total novice, Ernest had experience in the Yeomanry. So it is not surprising that Ernest went overseas well before Joe – he simply didn’t need so much training. In fact Ernest went overseas with the Carabiniers – which means that he served with the 1st/1st Hampshire Carabiniers. He also spent a spell in the regular cavalry as a trooper in the 10th Hussars (No 80622) and served in the infantry – the 1st/4th Battalion, Hampshire Regiment (No 27012. Ernest survived the war and died in the Newbury area in 1958 aged 67.